Hiring Managers far from bumble through the application shortlisting process, with it taking on average 6 seconds to decide if a CV is a yes or no. Simply, your CV should represent the best version of you and shouldn’t compromise on details of the qualities that make you uniquely suited to the position. Generic cliché’s may seem part and parcel of the application process and will probably remain part of recruitment lingo but can often do more harm than good, especially when the reviewer has a stack of applications that are almost indistinguishable. A hirer will want a hard-worker, why employ someone who isn’t? However, this is statement is ambiguous and relatively unquantifiable. Your efforts will have had pay-offs and in turn these successes provide a benchmark of your quality as a worker. Are you consistently diligent, efficient, driven, have a positive attitude? Emphasise not on what you have done but instead the value that you have delivered. Provide examples of how your hard work has had a positive impact on performance at individual, team and business level and use active rather than passive language to back these up. Passive: 15% revenue growth was recorded in our department across this year so far. Active: After just six months, I earned a promotion to manager and now oversee the work of four fee-earners. Passive: A promotion to manager was given to me after six months in the role. All roles require and necessitate teamwork, even if you predominantly work alone using your own initiative it’s likely that your work contributes on a wider scale and relates to the positions of other people. Essentially, it’s rare that you would not have developed any teamwork-based skills, even if you’re not the overt the “team player” many claim to be. With teamwork being a hallmark of most modern jobs, it’s expected that being a team player is part of your arsenal of skills. Therefore, listing it as a positive trait doesn’t help you stand out. Instead, you should focus on particular and exemplary instances of effective teamwork as well as stating how these examples demonstrate why these make you a good candidate for the position. My team have collectively surpassed our team targets by over 50% (on average) for the year so far. Alongside my fellow charity committee members, I have helped to raise a total £8,000 for charity through the co-ordination of several internal and external events. The counter argument here is that so-called team players unselfishly and heroically make sacrifices on an individual level for the benefit of their team. Whilst such passion is a great attribute, team achievement shouldn’t come at the expense of one of its members but be built on equality and be a benefit of unity. Aoife is part of the Douglas Scott administration team, joining the business in 2017. Her core responsibilities include daily administrative duties, providing phone cover and CV formatting, she also takes care of supply orders. Prior to joining Douglas Scott Aoife was an Operations Assistant and worked within Cash Management at her last job in a Manchester based flag ship retail store. Initially from Ireland, she moved to the North West to complete a Foundation Degree in Interactive Media and Animation and BA Hons in Animation. Aoife has worked on shows for ITV and Disney Channel/ Disney XD. There’s nothing necessarily wrong with wanting to highlight your enthusiasm or a love for your career! If anything, energetic and invigorative qualities are incredibly desirable. Used well and alongside evidence such as a promotion or a strategic move these phrases work. However, if dropped into your CV in an isolated context it doesn’t have the same effect. The implication is that you are progression orientated and have a desire to achieve, but to achieve what? You can expand on the phrase more specifically by (where relevant) detailing your goals and clearly detailing your progression to date. If invited for interview, reference how your aspirations align with the priorities of the business more specifically. If you write in an engaging manner, then your enthusiasm should be evident. Although this should not come at the expense of being concise and professional, especially in terms of tone. Both these words come under the spotlight, again for their relative vagueness. For one, it is expected that you will be committed to your position. Furthermore, if you are leaving your current role in search of another job elsewhere your claim of dedication could be perceived as somewhat contradictory. More often than not commitment does not need to be stated. Listing long periods of employment history or providing clear examples of your experience and market knowledge should in itself demonstrate a long-standing interest in your chosen field. Specifically state what you are dedicated or committed to – is it a particular field or practice area, generating growth and developing business, engaging with new clients, promoting equal opportunities and diversity, championing an inclusive and equal work environment or self-development? 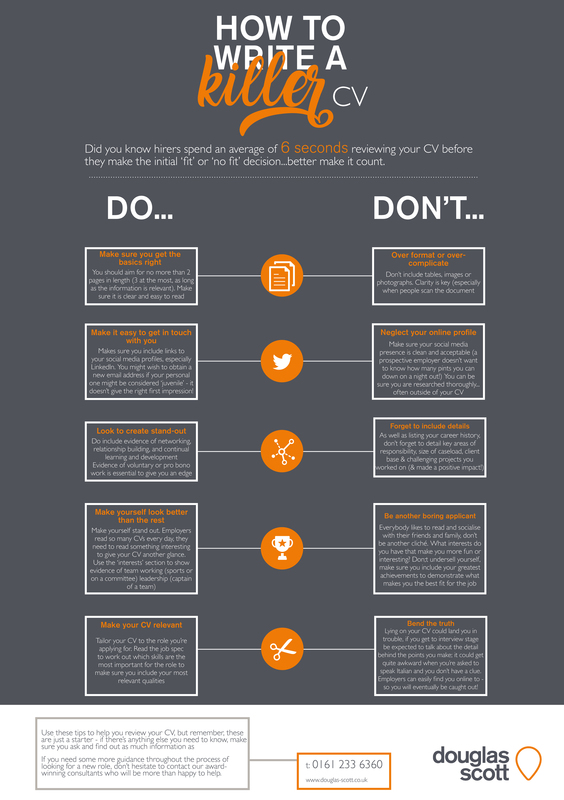 For more insight on CVs tips check out our advice page and infographics. You can view our latest vacancies here to send your newly updated CV directly to one of our expert consultants. Contact us on 0161 233 6360 for more information. Top tips and useful data in a handy visual format.